The beginning for 'Godzilla' starts here. 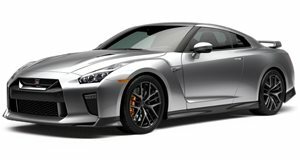 Many, many years before the car we know as the GT-R arrived on American shores, there was a car sold in Japan known as the Skyline, and this car had a high-performance trim level called GT-R. This would evolve over the years and eventually split from the Skyline lineup entirely in order to become the giant killer that we know today. The Skyline GT-R was the stuff of legends, and though it wasn&apos;t ever sold in the US a gray market existed to import them. This was hideously expensive, and Skylines were therefore rare, but this made any sightings all the more exciting. The Skyline nameplate dates all the way back to 1957, and in those days it wasn&apos;t even a Nissan. It was built by a company called Prince, famous for having built the Zero fighter plane during the war. It was a luxury car back then, and though there was a Sport trim, it wasn&apos;t called GT-R. Prince was acquired by Nissan in 1966 and in 1969 they brought out the first GT-R. It was powered by an inline six-cylinder engine, just like every other GT-R until its split from the Skyline. In those days it displaced 2.0-liters and produced 160 horsepower. That might not sound like much, especially compared to the current GT-R, but it was nearly double the power of the standard Skyline. And the little car didn&apos;t weigh much, so it was plenty quick. A second generation of the GT-R was made for 1973, but was cancelled before even 200 cars were built, due to the gas crisis. The GT-R finally returned in 1989, and this was the first of the R-series GT-R&apos;s, so named because Nissan&apos;s internal designation for this generation of the Skyline was R32. The I6 engine hadn&apos;t grown significantly in the intervening years, up from 2.0-liters to 2.6 liters, but the new RB26 engine was a whole different sort of mill. In fact, the whole philosophy behind the car had changed, and Nissan was no longer playing around. The engine was now twin-turbocharged and officially produced 276 horsepower, although it has often been reported by those with access to dynos that a more accurate figure would be around 320hp. It now had a new performance-oriented all-wheel-drive system of the sort found in the Porsche 959. This was hardly an accident, as Nissan built the GT-R with the idea that it would race, and they were gunning specifically for the 959. Nissan took the R32 GT-R to the Nurburgring, where it absolutely destroyed the production car record held by the Porsche 944. Australia would become the first export market for the R32 Skyline GT-R and it was there that it earned the nickname "Godzilla", in 1990. Being designed for motorsports, the RB26 engine was seriously overbuilt. Racing versions put out as much as 650 horsepower, and this is the sort of thing which always gets the attention of tuners. With such bombproof internals, a popular tuning practice was simply to bolt on bigger turbos. Burnt piston rings could result, but engines would rarely snap connecting rods or suffer from any of the more serious engine problems. Internals were often replaced anyway though. The RB26 was good for horsepower, but the AWD Skyline was heavy, and the relatively small displacement wasn&apos;t great for the kind of low-end torque you want for a heavy car. To correct this, engines were frequently bored and stroked up to and including 3.0-liters. Companies like HKS and GReddy even sold complete kits for this kind of major overhaul. Thus bolstered, it isn&apos;t unheard of to find a R32, R33 or R34 Skyline GT-R modified to produce 1,000 horsepower. Conversion kits even exist to make the GT-R rear-wheel-drive, mainly for cars intended for drag racing. This is done because the help which the AWD system gives to handling isn&apos;t needed, and the conversion cuts a couple hundred pounds off the weight of the car. The R32 was replaced by the R33 in 1993 and then the R34 in 1999, which ended production in 2002. All R-series GT-Rs were popular with tuners, and all of them used the same RB26 engine. After 2002, the GT-R split from the Skyline, and a new Skyline would come over to America as the Infiniti G35. Nissan would take their time in bringing back the GT-R, but when the first non-Skyline GT-R was unveiled in 2007, it was an awe-inspiring piece of machinery. The R-series Skyline GT-R was the Holy Grail of tuner cars, a cheaper, more customizable and street-legal Porsche 959. This wasn&apos;t just a sports car, but a serious street able race car. The mythological status it achieved might have been helped by its rarity, but don&apos;t think for a minute that this was a car undeserving of the hype.